Lil Abner and his band.. Tinplate wind up comic toy. Li'l Abner was a satirical American comic strip appearing in many newspapers in the United States and Canada, featuring a fictional clan of hillbillies in the impoverished town of Dogpatch, Kentucky. Lil Abner and his Band. 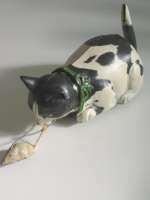 Comic tin Toy from about 1940. USA. Wind up. 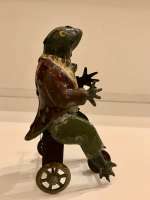 Working excellent with a lot of action.. A very charming mechanical tin toy. L.25 cm. H. 22 cm. Alle figurer spiller og bevæger sig, når legetøjet trækkes op. Dancing Sailor made by Lehmann, Germany.EPL# 555. 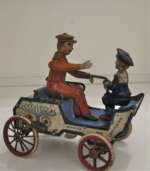 A tin plate toy made by Lehmann,Brandenburg from 1904 to 1948..A wind up toy. Walking on his feet and dancing on his head. Good condition and working fine. The dress is made of clothes. All original. Size:H= 17,5 cm/7,5 inch. Literature:See Heike Köhler og Katharina Kreschel,Von Störischer Esel zum Kletteraffen Tom.Brandenburger Museumshefte 6,Brandenburg an der Havel 2007. Jürgen & Marianne Clieslik,Ein Jahrhundert Blechspielzeug,München 1981. Helmut Schwarz og Marion Faber,Moving Times,Ernst Paul Lehmann Patentwerk,,History on a Toy Factory,Toy Museum Nürnberg 2003. Paddy and the Pig.Lehmann,Tyskland.EPL# 500. 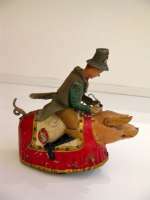 "Paddy and the Pig" or "Schweinereiter" made by Lehmann, Brandenburg.. Amusing tin toy with a man seated on pig with his pipe placed in his hat. When he is wound up he goes back and forward on the dancing pig. 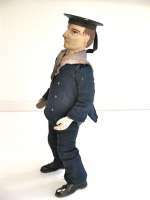 Hand painted overall, figure in cloth suit, clockwork driven. Very good condition all over.EPL# 500.Size:L= 6 inch-15 cm. Literature:see Heike Köhler og Katharina Kreschel:Von Störischer Esel zum Kletteraffen Tom.Brandenburger Museumshefte 6,Brandenburg an der Havel 2007. Jürgen & Marianne Clieslik: Ein Jahrhundert Blechspielzeug,München 1981. Helmut Schwarz og Marion Faber: Moving Times, Ernst Paul Lehmann Patentwerk, History on a Toy Factory, Toy Museum, Nürnberg 2003. An american piece of toy from about 1935.The black man is stepping with a wind up mecanism.A very impressive litographed base .Very good contion.Americana. LEHMANN NAUGHTY BOY.Fine Lehmann German toy with a man driving an open air vehicle while his son attempts to grab the tiller.EPL # 495. Clockwork driven. Good condition.The Litho is fine, some wear to boys head. Functions well. SIZE:L= 5" / 12,5 cm . Literature: Heike Köhler og Katharina Kreschel,Von Störischer Esel zum Kletteraffen Tom.Brandenburger Museumshefte 6,Brandenburg an der Havel 2007. Jürgen & Marianne Clieslik,Ein Jahrhundert Blechspielzeug,München 1981. Helmut Schwarz og Marion Faber,Moving Times,Ernst Paul Lehmann Patentwerk,,History on a Toy Factory,Toy Museum Nürnberg 2003..